Pat the chicken dry with paper towels. Season both sides with salt and pepper. In a large cast iron (or regular) skillet, heat the oil over medium heat. Add the garlic and stir it around to flavor the oil. Add the chicken, skin side down, and cook until the skin is golden brown and crisp, 5 to 7 minutes. Flip the chicken and cook until the chicken is cooked through, 5 to 7 minutes more. If the garlic starts to get too brown, transfer it to a small bowl for the time being. Reduce the heat to low and add the butter. 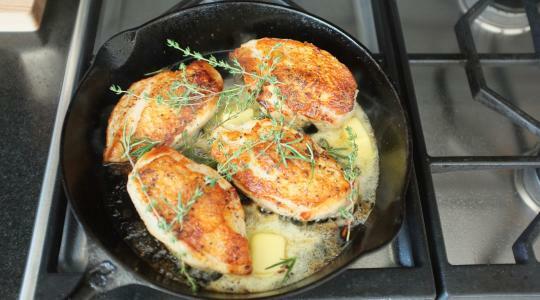 Pull the rosemary leaves from their sprigs and sprinkle over the chicken. Scatter the thyme sprigs over the chicken, too. Return the garlic to the skillet if you took it out. 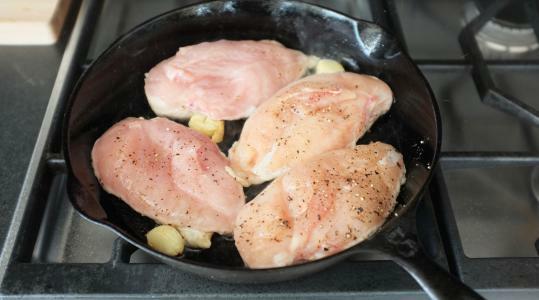 Using a spoon, baste the chicken with the melted butter (for about 30 seconds). Serve the chicken with the garlic and herbs.